Here's how to make apple juice at home quite quickly and simply! If you have access to a plentiful supply of fresh organic apples it may be worth making apple juice at home. It’s easy to do and can even be fun if combined with other autumn treats and activities. I’ve lived in a home with a large apple tree in the garden for more than ten years. Every year we make pies and store some surplus apples in the freezer. Last year I discovered a couple of new ways to use all those wonderful apples – making fruit leathers and drying apple rings. But, all this time I had thought that because my apple tree is a cooker, the apples really needed to be cooked! Kind of obvious, you’d think. 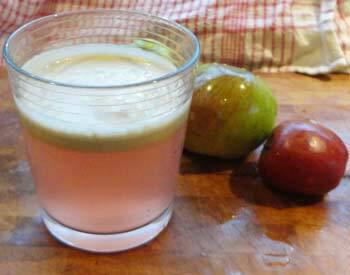 Yet I’d been missing one of the easiest and healthiest ways to use my apples: juicing. Making apple juice is easy! Knowing how to make apple juice is easy. You just need to prepare and clean the apples, chop them into suitable sizes and then drop the pieces into a juice extractor. This is probably the easiest method for most of us. Juice extractors are relatively pricey but should last a good many years. I’ve had mine since the mid nineties at least. As regards energy – yes you need electricity. They are typically from around 400 watts up to around 1000 watts. However, they work fairly quickly so your energy consumption is unlikely to rival your washing machine, for example. It takes around two minutes to press enough juice for one person. The alternative is a hand crusher or an apple press. Both of these tend to be quite big and expensive machines. Hand crushers are also quite hard work and potentially hazardous. They are both more suitable for making cider, where large quantities of apple juice are needed. Which apples to choose for the best juice? Cookers such as Bramleys make good juice. I tend to add in a sweet apple or two to each batch. The exact type or variety of apple is unimportant - but you will get better juice from fresh, crisp apples. For best results, don't use under-ripe ones or ones that are starting to go soft. You can have fun making apple juice from specific varieties but really any clean, sound apples will do provided that they are not too sharp. I find Bramleys work perfectly well. Wash the apples carefully. I prefer to dry them as well as this gives me a good chance to find any hidden bruising. I tend to leave the skins on if the apples are relatively blemish-free. The skins contribute a lot of flavour. You don’t really need to take out the core but check that it looks wholesome. Earwigs and other insects can take up residence in the heart of the apple, so it’s worth taking a look to make sure each one is clean. A corer and peeler is quite useful if you want to get rid of skin and cores at the same time (- see picture above). Some people will prefer to get rid of the core as apple pips do contain a small amount of a type of cyanide! Most people will be able to cope with these small amounts without any ill effects. I've certainly never hesitated to devour apples, cores and all and never noticed any bother. 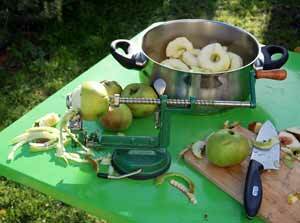 Chop the apples into chunks which will fit into the hopper of the juice extractor. Make small batches as prepared apples oxidise (rust) quite quickly. I chop the apples into a glass bowl. Five or six good sized apples will make about 1/3rd of a pint – enough for one generous glassful. You need some clean containers such as glass jugs. Glass is best because you can see the quality and level of the juice clearly. Some sterilised bottles for storing the juice are needed if you are going to process more than a few apples at a time. Fresh pressed apple juice will store in the fridge well enough for a day or two. Leave the froth on top to protect the juice from oxidation. If you want to store your apple juice in a freezer, then plastic bottles are good. Take the froth off before bottling. Juicing apples tends to result in quite a lot of froth which naturally rises to the top of the collection vessel. The best way to get rid of it that I’ve found is this. Let the juice settle for about ten minutes - quite a lot of it settles back down into juice, so this way you maximise the amount you get from your apples. Get a spatula or wooden spoon and hold back the froth as you pour off the apple juice into another container. The apple juice will mainly just slide from under the froth, leaving an almost clear liquid (depending upon the types of apples used). For this method to work, you need to only half fill the collection vessel, otherwise the froth will get in the way when you try to pour the juice off. A collection vessel with corners is also a help in separating the froth from the juice. Alternatively, pour the juice quickly, retaining most of the froth for a tasty and almost effervescent drink, brimming with enzymes and goodness. There is no real need to lose the froth if the apple skins are good and sound. How healthy is apple juice? There have been scare stories about apple juice. Certainly the packaged supermarket varieties may be too high in sugars. Some types of sugars can cause fermentation in the gut if you over-indulge. There is a naturally occurring sugar alcohol called sorbitol which can cause problems for some people. If you suffer from IBS, for example it may be wise to limit how much of it you take. Sorbitol can lead to bloating, flatulence and even diarrhoea. There also may be some hazard in drinking apple juice from apples which have a lot of bruising. It is also a good idea to be aware of how much carbohydrate and sugar you have in your diet overall. Apple juice is fine in moderation as part of a healthy diet. I personally would not choose to drink it more often than once a twice a week. Apple juice typically delivers around 12 grams of carbohydrate per 100ml. Apples contain vitamins, flavonoids and phenols and a good many of these will be present in freshly squeezed juice. Drink the juice straight away if possible as vitamins and enzymes tend to deteriorate on exposure to air. The froth tends to rust quite quickly, so if you want to drink the juice, with froth, at its best just drink it straight away. I always notice a lift from drinking natural homemade apple juice. This may be partly due to the natural sugars but is almost certainly partly due to the enzymes and vitamins present. I certainly notice the difference between drinking fresh apple juice and drinking a fruit squash, even the "high juice" kind. For a discussion of the benefits of commercial juices please see: Healthy Fruit Juice. I try to drink fresh apple juice once or twice a week during the apple season. I've certainly noticed the benefits for my stamina and general sense of health and vitality. I don't seem to catch autumn colds anymore, either. Here are some more benefits of homemade apple juice. Quercitin in apples may protect against Alzheimer’s and Parkinson’s disease. Antioxidants have many benefits and help prevent diseases such as cancer. Pectin could help to lower LDL cholesterol - one of the health-scourges of our age. Avoid using apples that have been sprayed. Supermarket apples often contain pesticide residues. In fact they are one of the most badly affected of natural foods according to the EWG. See also my page on the benefits of common fruits including apples: Fruit Nutrition Facts. Making apple juice at home without a juice extractor is possible. You need to first mince or grate the apples. Add a little cold water to the mix (optional), press the mix with a potato masher or similar tool and then press the apple though a sieve or muslin bag. This is labour intensive and you will not extract as much juice as using a machine. 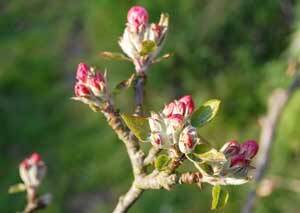 Picture: Apple blossom - another benefit from growing apple trees!